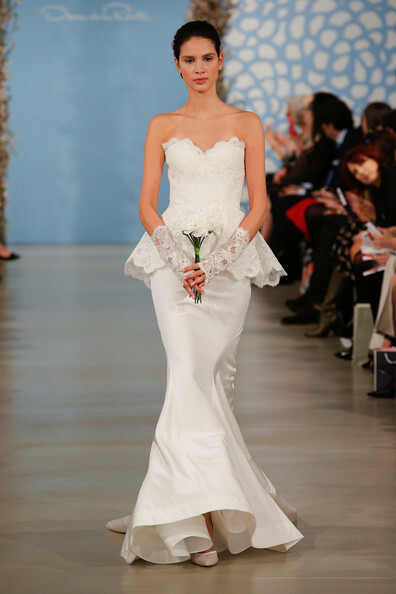 It’s apparently bridal fashion week (for Spring ’14? What the hell, fashion industry? It’s barely Spring ’13). I am also apparently a very poor member of my industry because I had no idea until about 30 minutes before writing this that that was the case. Whoops. Anyway, bridal fashion week usually ends in me stomping about being surly about some trend I do not want to indulge people in and/or some I am peevish that will not make it far in places not a thriving metropolis. After one day, it appears we can expect more frothy lace, frothy lace sleeves, frothy lace peplums (note: I have yet to see an actual frothy lace peplum anywhere but the runway, but it’s only a matter of time now since I saw it at Marchesa, de la Renta, Carolina Herrera, Vera Wang AND Reem Acra. Seriously. Everyone but Temperley London’s had a lace peplum so far, and Temperley seemed to think they were costuming Downton Abbey. ), and silly accessories. I am not messing around when I say the accessories were silly. Here is the important question: Is the veil attached to the dress, or is it just weird? Has Oscar de la Renta actually lost it? Yes, that is baby blue. Yes, she is wearing net gloves. No, I do not understand the point. Frankly, I am leaning toward weird. I was amused to see that gloves made the transition from mainstream pre-fall into bridal Spring, particularly over at Vera Wang, where the models were not wearing veils, but were instead wearing opera length black leather gloves. Double awkward points for the petal shaped hip pads. That is a frothy lace peplum, though. I would also like to state that every look in that show involved black, most beyond just the obligatory silly gloves. I love black. Black is my favorite color. But would I want a wedding gown with a black bodice? NO. Then we have two very silly accessory decisions from one of my favorite bridal designers (at least as far as entertainment goes) to close out Day 1? 2? of bridal fashion week. 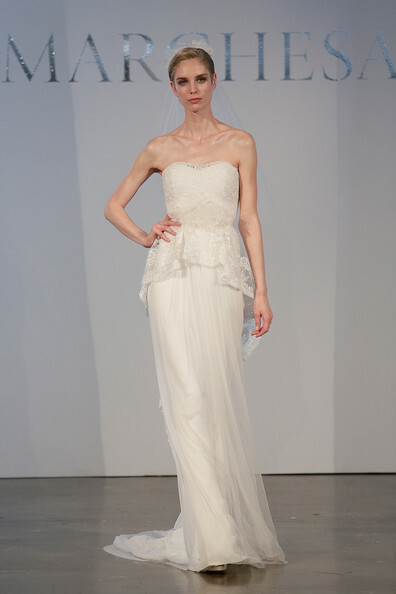 Oh Reem Acra. Never stop. I swear, if I ever have a bride want something like that or turns up with one, I will just laugh myself senseless. It will be beautiful. Also beautiful is this delightfully wonky take on a veil. This may be the picture that inspired this morning’s bridal-related amusement. I love-hate this. It’s so bonkers I’m in love with it. This combines many things I would normally not want to have (parasols, parasols saying “Just Married”, long layered veils that feel like mosquito netting, long layered veils covered in twee flowers, and a questionably opaque dress), but I oddly love it. I know I shouldn’t. I want to hate it. But I love-hate it. It’s so crazy it’s fantastic. But that doesn’t mean I’m not aware that those who are not running on very little sleep are probably much less amused by this display of overly cute crazy. I’m getting a veil parasol. Thank goodness I saw this before the big day. I still have time to have “Maggie + Deren” hennaed on my forehead. I’m so glad you saw and commented on this post. And you should definitely get a veil parasol. It will be AMAZING. Did I send you a pic of the dress I got? And of course I read this one, how could I not??? So much weird stuff. I have no words for the parasol.